Since the last ice age, around 11,000 years ago, the Earth’s climate has remained relatively stable, with global temperatures averaging at about 14°C. However, in the last century climate has started to change rapidly as the Earth's temperature has increased by approximately 0.7°C. Most climate projections reveal that this trend is likely to continue, resulting in an increase in global temperatures of between about 1 and 6°C by the end of this century (IPCC, 2007). There are many factors that can cause a warming of our climate; for example, more energy from the sun, large natural events such as El Nino or an increased greenhouse effect. Scientists have ruled out the sun and natural variations in our climate as the major causes of the recent warming. There is overwhelming evidence that most of this warming we’ve seen is due to increased amounts of greenhouse gases in the atmosphere. Greenhouse gases, such as water vapour, carbon dioxide and methane, occur naturally in the atmosphere. But human activities have directly increased the amount of carbon dioxide, methane and some other greenhouse gases. These increases can be through the burning of fossil fuels such as oil and coal, and changes in land use such as chopping down forests for cattle grazing. On top of this we have seen changes in extremes of weather events, such as heatwaves and heavy rainfall. The current changes are very unusual and can not be explained simply as part of any natural cycle, such as El Nino and La Nina, which cause the warming and cooling of the tropical Pacific Ocean, which affects world temperature. Natural cycles can lead to periods with little or no warming and other periods with rapid warming. However, what is important is to look at the longer term trends in temperature, which are rising, and which scientists believe is almost certainly caused by human activity. 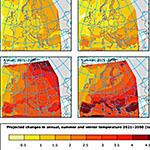 The last decade (2002–2011) was the warmest on record in Europe, with European land temperature 1.3°C warmer than the pre-industrial average. 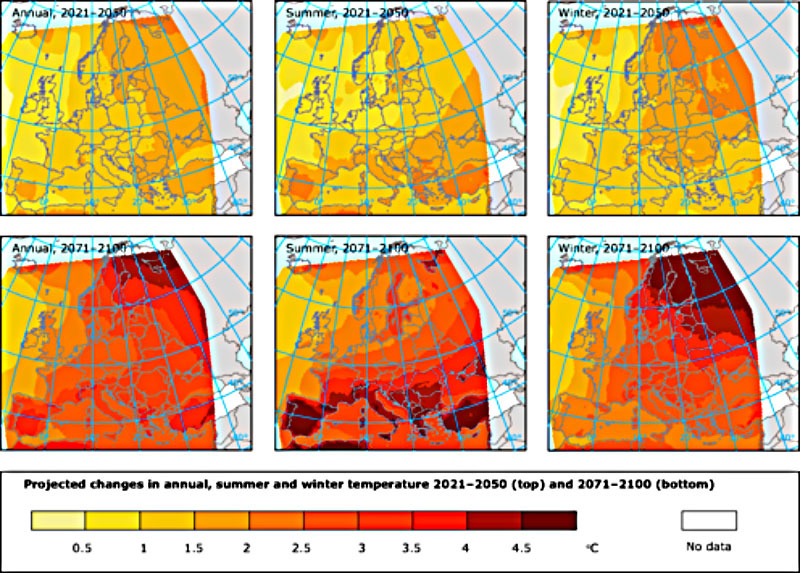 Various model projections show that Europe could be 2.5–4°C warmer in the later part of the 21st Century, compared to the 1961–1990 average. The Arctic is warming faster than other regions. Record low sea ice was observed in the Arctic in 2007, 2011 and 2012, falling to roughly half the minimum extent seen in the 1980s. Melting of the Greenland ice sheet has doubled since the 1990s, losing an average of 250 billion tonnes of mass every year between 2005 and 2009. Glaciers in the Alps have lost approximately two thirds of their volume since 1850 and these trends are projected to continue. 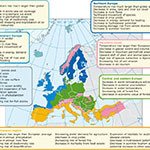 While precipitation is decreasing in southern regions, it is increasing in northern Europe. These trends are projected to increase river flooding, particularly in northern Europe, as higher temperatures intensify the water cycle. At the same time, river flow droughts appear to have become more severe and frequent in southern Europe. Minimum river flows are projected to decrease significantly in summer in southern Europe but also in many other parts of Europe to varying degrees. Many studies have measured widespread changes in plant and animal characteristics. For example, plants are flowering earlier in the year, while in freshwater phytoplankton and zooplankton blooms are also appearing earlier. Other animals and plants are moving northward or uphill as their habitats warm. Since the migration rate of many species is insufficient to keep pace with the speed of climate change, they could be pushed towards extinction in the future. Studies worldwide have provided a clear, globally coherent conclusion: Twentieth-century anthropogenic global warming has already affected Earth’s biota. The impact of climate change on biodiversity patterns has been investigated and predicted in a large number of recent case studies addressing mammals, birds, amphibians, terrestrial insects, spiders, terrestrial plants, combinations of different taxonomic groups and aquatic biota including insects and fish These changes will not, however, be identical around the world as Temperate and Polar Regions will experience more pronounced changes in temperature than tropical regions (IPCC, 2007). Organisms, populations and ecological communities do not, however, respond to approximated global averages. Rather, regional changes, which are highly spatially heterogeneous, are more relevant in the context of ecological response to climatic change. Evidence shows that many of the effects of changing climate are already occurring. 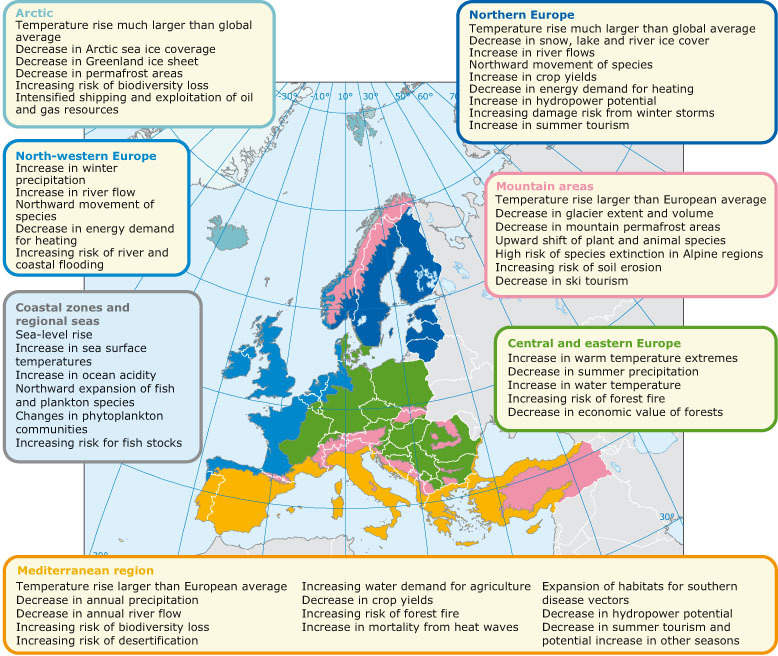 These include: (i) an increase in the surface water temperature of lakes and streams across Europe, especially those at high altitudes and latitudes; (ii) an increase in hypolimnetic temperature of large deep lakes; (iii) a reductionin lake ice-cover; and (iv) the melting of mountain glaciers and permafrost causing changes to discharge regimes in mountain streams and release of solutes and pollutants to surface waters. In the future it is likely that these trends will continue and it is probable that (i) there will be changes in the flow regime of streams and rivers associated with projected changes in the amount, seasonality, intensity and distribution of precipitation, causing an increase in the transport of sediments and nutrients downstream to lakes and the coastal zone; (ii) there will be changes in precipitation, evaporation and flooding dynamics that will cause changes in water levels, habitat structure and water residence times in wetlands; (iii) small intermittent streams and small lakes in warm dry areas may disappear, while flow in permanent streams may become intermittent and lakes may become more saline; and (iv) systems already ata threshold between two different conditions may change abruptly, e.g. may switch from permanent to intermittent streams, from freshwater to permanently saline lakes, from non-stratifying to stratifying lakes, or from dimictic to monomictic regimes. The ecological response of freshwater ecosystems to climate change needs to allow for interactions between climate change and the many stressors already affecting rivers, lakes and wetlands. These include water resource management, eutrophication, acidification, toxic substances, hydromorphological change, catchment land-use change and invasion of exotic species. The observed and expected impacts, however, differ strongly between ecosystem types (lakes, rivers, wetlands) and climate regions. In Euro-limpacs three major climate settings were distinguished: cold; temperate and warm-humid; and warm-arid. In cold regions expected changes include: (i) primary productivity increase in response to an increase in the length of the growing season (because of shorter ice-cover) and an increase in nutrient release from catchment soils; (ii) population decline or loss of cold stenothermic species, such as arctic charr, in response to increasing water temperature; (iii) changes to food-web structure (Jeppesen et al. 2009), which in lakes leads to higher phytoplankton biomass and a decrease in hypolimnetic oxygen concentrations as well as an increase in nutrient release from sediments; (iv) adverse impacts on submerged aquatic plants caused by changes in underwater light regime resulting from an increase in water turbidity caused by more intense precipitation and suspended sediment loads in summer; and (v) increased invertebrate drift in rivers as a result of scour from increased meltwater discharge. In temperate and warm-humid regions freshwaters are especially vulnerable to problems of eutrophication. Climate change is expected to confound attempts to restore lakes, rivers and wetlands especially through its influence on water temperature, hydrology and nutrient balance. For lakes higher temperatures are likely to lead to higher primary productivity with more intense algal blooms, stronger and longer periods of summer stratification with greater oxygen depletion in the hypolimnion and increased release of phosphorus from sediments. These environmental changes will further result in significant modifications in the distributions of species across ecoregions, higher susceptibility to alien species invasion; and overall biodiversity reduction that may eventually lead to impaired ecosystem services. The responses of the biota to these changes are less predictable than the response of chemical or hydrological variables and are expected to act differently in different ecoregions. Increased water temperature will also lead to a change in food-web structure with higher winter survival of fish due to reduced ice-cover, and a general switch from dominance of zooplankton and aquatic macrophytes to fish and phytoplankton. Changing precipitation patterns towards higher winter amounts and more intense storms in summer are expected to increase nutrient loading from increased erosion of agricultural soils and more frequent overflows of sewage treatment systems. For rivers increased temperature will cause stress for fish and invertebrates with high oxygen requirements leading to changes in community composition and an upstream shift in both the abiotic and biotic characteristics of river systems along the river continuum. It will also restrict habitats for many organisms, and some taxa, especially salmonid fishes and cold stenothermic macroinvertebrates, are expected to be lost from many central and southern European river systems. Changes in flow regime as a result of changes in the pattern and intensity of precipitation are expected to have pronounced effects on river habitats and communities. Especially at risk are systems that experience flow reductions significant enough to lead to reduced concentrations of dissolved oxygen and an increased vulnerability to eutrophication. For wetlands where climate change leads to drier conditions desiccation of wetland surfaces may lead to the loss of aquatic biota and the invasion of non-wetland species, including woodland species. On the other hand, an increase in extreme precipitation events and increased winter flooding may result in increasingly wet conditions in temperate wetlands, with potentially positive consequences for the functioning of floodplain wetlands, especially with respect to nutrient dynamics and habitat structure. In warm-arid ecoregions in Europe changes in moisture balance are expected to have severe consequences for freshwaters. Reduced precipitation coupled with increased temperature will lead to the loss of habitat and to changes in community composition resulting from a decrease in lake-levels, a reduction in river flow and increased eutrophication. In the dry season rivers and lakes that are currently permanent may experience intermittent desiccation and those that are currently intermittent in character may become ephemeral or disappear completely. Changes in community composition and food-web structure caused by increased salinity are also expected. Endemic taxa will be threatened both by habitat loss and as a result of reduced connectivity between habitats, especially if water-flow connections are lost. Higher evaporation rates coupled with reduced precipitation, will lead to the continued lowering of water tables and many of the remaining wetlands in the region will be threatened, exacerbating losses already experienced from drainage works during the 19th and 20th centuries. These observed and predicted changes in freshwater ecosystems as a result of climate change challenge, the major European Directives on water quality and on species and habitats currently in force. Adaptive measures are required that are both ecologically and economically effective and capable of practical implementation at the local scale. Walther G-R, Post E, Convey P, Menzel A, Parmesan C, Beebee TJC, Fromentin J-M, Hoegh-Guldberg O, Bairlein F. 2002. Ecological responses to recent climate change. Nature 416: 389–395. link to article. Heino J, Virkkala R, Toivonen H. 2009. Climate change and freshwater biodiversity: detected patterns, future trends and adaptations in northern regions. Biological reviews of the Cambridge Philosophical Society 84: 39–54.